Twenty years ago, we did not completely understand that we were about to begin a complex and rewarding adventure. When we sat in our apartment in Tokyo planning an olive orchard, it all seemed so simple and, perhaps, romantic. Our ranch is so similar to Tuscany, it seemed making Tuscan olive oil was a given. 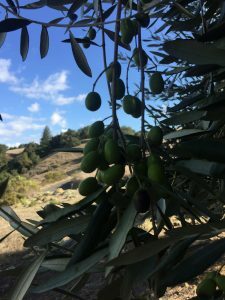 Early Italian immigrants in this area successfully planted olive trees in the late 1800’s, and many of those trees are still producing. We were convinced that it might take hard work, but we were sure that we would produce oil. We did not know how good our oil might be, but we hoped that it would be better than the oils on offer in the markets. There is great excitement and anticipation when you plant your trees. Especially so since the type of trees we planted can outlive us, our grandchildren, and their grandchildren. 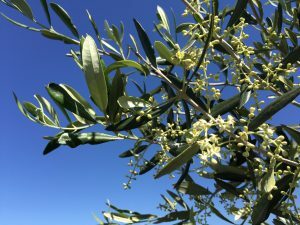 We knew that it would take approximately 5 to 7 years of effort until the trees reached a level of maturity that would enable us to make olive oil. During those years, the trees did their thing and we did ours. Most importantly, we learned that Mother Nature can make life miserable and spectacular. 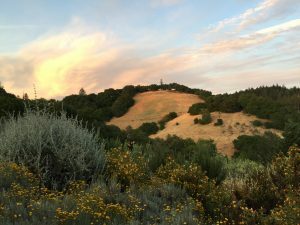 In past letters, we mentioned some of her cruelty, but this year….wow… The drought ended with 67 inches of rain; the orchard is green and gorgeous. It may sound odd, but when you have planted and lived with the trees over such a long period, you can form attachments to particular ones. I have my favorite tree, and it is the one that I talk with to find out about each year’s crop. The olives are now growing and, to my great delight, my favorite tree is a picture perfect “Mother”. Having seen Mom’s offspring, we are confident this will be a terrific year. In early to mid-November, we will harvest. We try to do something commercial companies cannot and will not do. We ship our olive oil within days after harvest, thus allowing all of you to have truly fresh olive oil. We finish harvest at 6:00 p.m., start milling our olives within hours, and bottle as quickly as we can. In many years, our customers have received their olive oil within a few days after harvest. Truly fresh olive oil is a luxury that is usually only available if you are in Italy and are at the mill when they press. 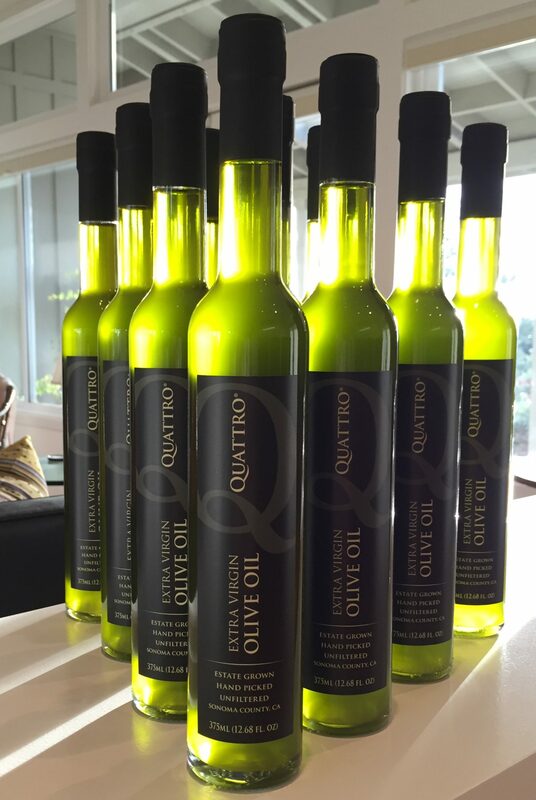 We know that many of you, especially our business and professional customers, share our olive oil with clients and customers, as well as their families, as Christmas and Hanukkah presents. During the past few years, some of you have supplied us with your gift list, and we have perfected the art of shipping to folks on your list. We really enjoy knowing that our oil is shared by people you value. Since Raleigh and I do most of the jobs in our company, including acting as shipping clerks, we want to plan for group shipments. If you think you would like to have us ship olive oil to your gift list, please send us a note advising of the approximate number of people that may be included. We do not need an order right now, but advance information will allow us to gear up for gift shipments. Our gift shipments usually include a letter from you as the sender, or we can include gift cards. As the growing season progresses we will update you on our progress and give an estimate of the harvest time. 2015–Is Mom Nice This Year? Saturday: Sometimes 11:00AM–3:00PM, sometimes not at all.